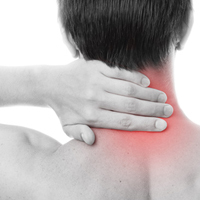 Neck pain can be extremely debilitating, but thankfully it is often easily sorted with Chiropractic treatment. The main causes are problems in the muscles and joints, and wear and tear – all of which can be addressed with a combination of adjustments and soft tissue work. Before starting treatment, your Chiropractor will always carefully make sure that it is nothing more serious than this, but once that has been established you will be set well on the way to recovery. The neck is defined as anywhere from the base of your skull to the top of your shoulders, but pain from this area can frequently cause problems elsewhere. Sometimes it’s accompanied by a stunning headache, sometimes by tension across the top of the shoulders and occasionally there is pain or tingling and pins and needles spreading right the way down your arms. It all depends on what is causing the pain. Even if it does stay completely localised to your neck, it can be extremely uncomfortable and can even prevent you from being able to drive safely as you simply can’t turn your head as freely as you need to in order to look all around your vehicle. The most common causes of neck pain are the muscles and joints in the neck. Your neck is a comparatively unstable structure – if you think about it, you have a fairly slender structure which can bend in all directions, supporting approximately 9lbs (4.5kg) of your head…no wonder it is prone to injuries relating to movement! The slightest restriction of movement in the joints can cause a significant lost of function, and the muscles will almost always tense up in order to try and protect the painful area. They simply will not allow you to turn your head in a way that will hurt the joints. This tension in turn can send pain into your head, typically curling up and around your head to a point just above your eye. A lot of the muscles in your neck also continue into your shoulders, and so if they have become tight to protect the neck joints, you will feel the tension continuing across the top of your shoulders or down to the top part of your shoulder blade. Wear-and-tear, or osteoarthritis, is another very common cause of neck pain as you get a bit older. That spectacular mobility mentioned above is all very well, but it does put a lot of strain through the joints which can cause them to degenerate. If you have ever been involved in an accident, either at work, in the car or during one of your hobby activities such as mountain biking or horse riding, it is quite likely that you will have injured your neck in some way. You may not have even noticed it at the time, but the change has happened. Extremely frequently, when I ask people about their previous accidents during their initial appointment, they will brush off the incident – “oh, that was years and years ago – surely it doesn’t matter now?”. The answer is yes it does!!! In fact, I am much more interested in the one that happened 20 years ago than the one that happened last year. If it happened a long time ago, then the body has had to carry on functioning as best it can with any damage that was done, so it has had much more time to wear down the joints from the added strains. In cases of osteoarthritis in the neck, Chiropractic will be aiming to maximise the movement through the joints and keep the muscles as relaxed as possible. It is not something that we can “fix”, but we can certainly manage it to the point it doesn’t affect your activities of daily living. As discussed in the sections on low back pain and sciatica, it is also possible for the discs or joints in the area to cause a problem affecting the nerves. This is where pain or pins and needles, numbness or tingling can spread down your arms right to your fingertips. In the early stages, you may only feel a change in the sensation at the top corner of your shoulder blade, but this can progress to an extremely uncomfortable condition called “radiculopathy”, where the pain goes all the way down your arm. Unlike when this condition occurs in your low back, it is possible that doing an adjustment in the area where there is a disc injury in your neck will cause a worsening of your symptoms initially. At Shifnal Chiropractic, we will therefore often try some more gentle methods first, and only if we don’t see the progress we would hope for will we try a full adjustment after fully explaining the pros and cons to you as the patient. Even without adjustments though, Chiropractic has many tools at its disposal to facilitate your recovery from a nerve impingement injury such as disc herniation. As in any complaint like neck pain, there are also a few causes that are more severe. If there has been significant trauma, such as a road traffic accident, it is vital to rule out fracture through the use of x ray imaging. During your first appointment, your Chiropractor will also spend a significant amount of time ensuring there is no suggestion of serious conditions such as meningitis or cancer – these are extremely rare and unlikely conditions for you to have, but it is vitally important that they are not missed if they are present. Generally, then, Chiropractic is an extremely effective form of treatment for the most common causes of neck pain – problems with the joints, muscles and nerves of the neck – so why not contact us today to start your recovery.